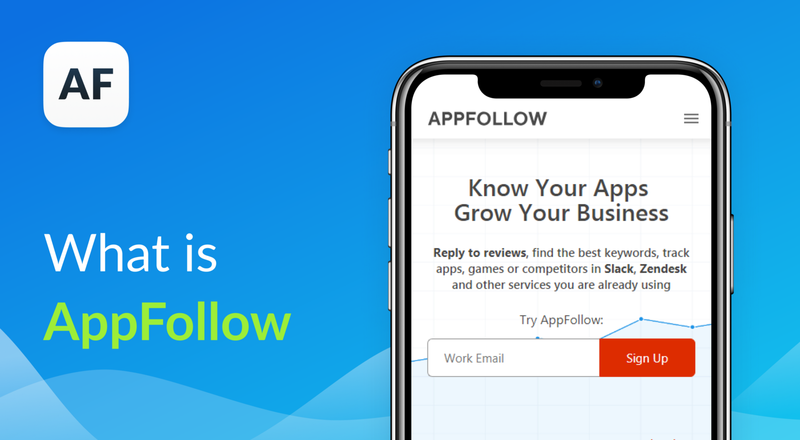 AppFollow is a service that allows you to promote your mobile app or game by combining Data Mining, App Store Optimization and Customer support. From the article you’ll learn why to use AppFollow, who needs it and when, and how to begin working with it. AppFollow tools will be helpful for both corporations and indie developers. Increase ratings: get your app featured and engage more users with less investment. AppFollow has it all. Product managers, developers, marketing team, and support managers can use the service, get access to all the data, and see what their colleagues do. It’s so much faster than putting together tables and reports from different sources or asking other departments for data. ● Support managers and agents. Monitoring system helps the team be aware of what is happening with the app. 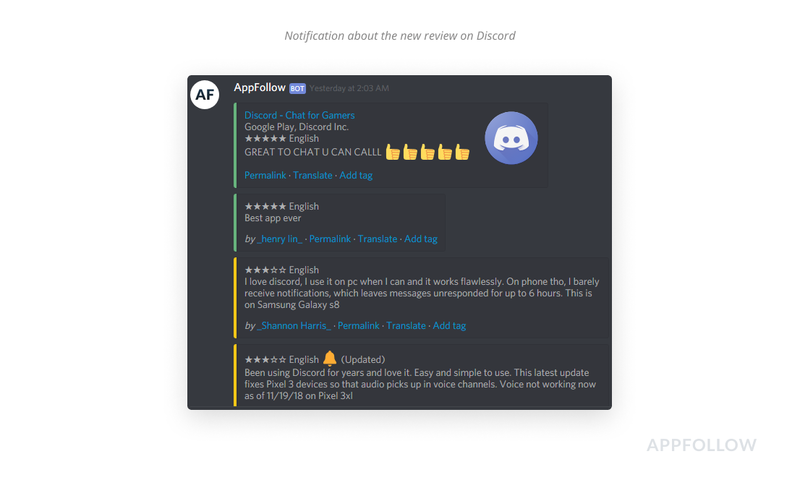 The notifications about app rankings changes, user complaints, or rating updates after the release or conversion rate growth after the latest graphic upgrade will go straight on a Slack or Discord channel, or AppFollow account. Analyze data using a single format. All stores use their own estimating metric systems: views, conversion rates, keywords positions, installs, etc. It takes a lot of time and effort to make them even and analyze. AppFollow already receives data in one single format, and now you can go straight to the analysis. See what your users think. How will your users react to a new feature or design? Be the first to know anywhere and any time. Use the tools that you like: team chats (Slack, Discord), Telegram, email, or any other system with the help of API and Webhook URL. If you are only preparing to launch, check what users think of the updates and features of your competitors’ apps. This way you can escape repeating their mistakes and release a new awesome product! After a big update, the ratings went down. It’s a common cause that users get used to the new features, and then the rating goes up again. This indicates that the product is developing in the right direction. Otherwise, the rating would drop. 4. Learn more about customers’ needs. Check where they are from, what they talk about, and what they think of the app. Very often users write what features they would like to see in a product. So, keep an eye on the reviews and fill up your backlog. 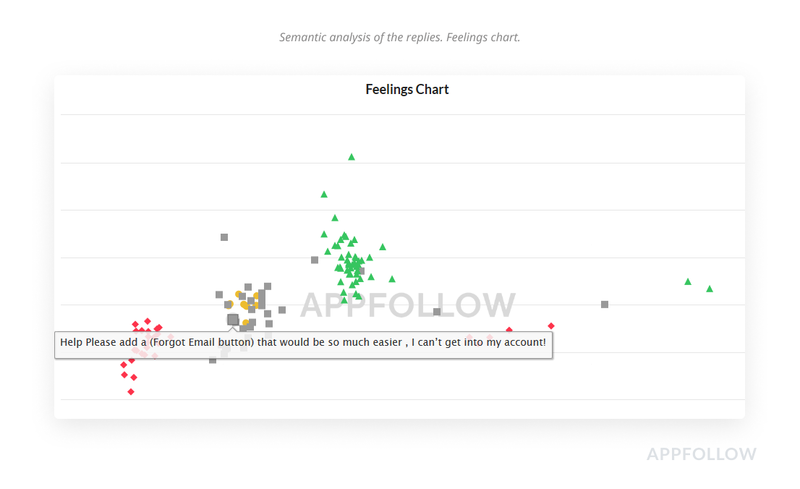 A Feelings chart combines the reviews based on topics and highlights a particular color for a certain emotional state. For example, dozens of users couldn’t log in to the app, that’s why there is a group of grey-colored dots. The more dots in one point, the more users wrote about the specific issue. 5. Keep an eye on your competitors. Competitors are the best sources of inspiration. Check out what they change in their products and app store optimization. Examine how they change the texts, icons, screenshots, what updates release, and how they communicate with the users to learn how to improve your own product. Here we see that competitors have changed an icon and screenshot in a new update. They are probably testing how horizontally-laid out screenshots can influence the conversion. 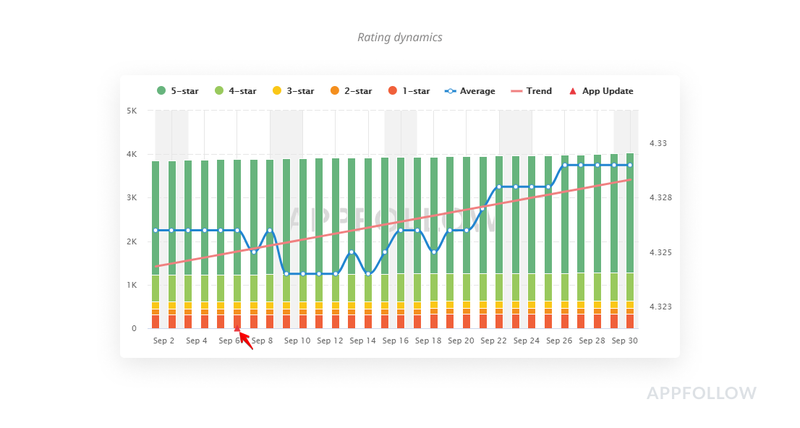 You can also check the results by monitoring the rating dynamics. By watching your competitors, you will significantly save time on data analysis and beat them in ASO and new features development. 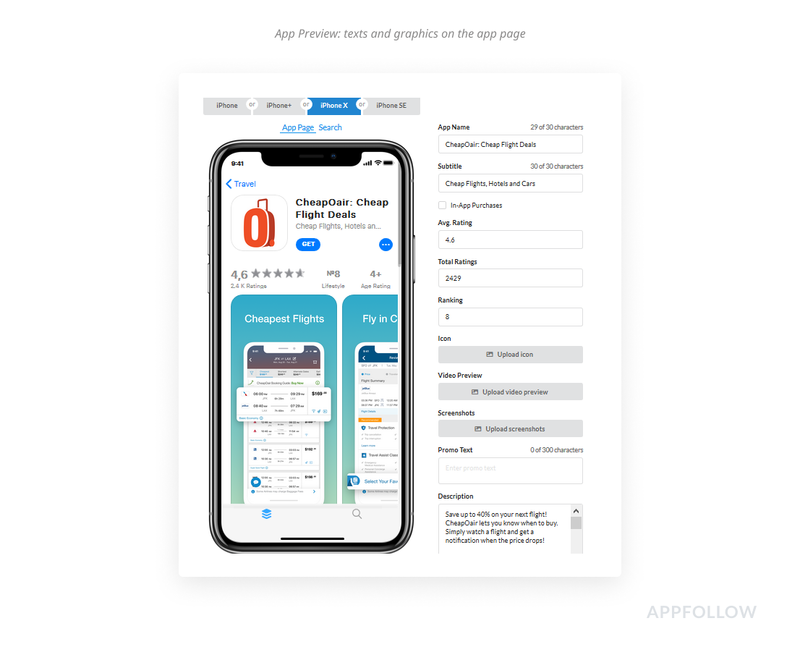 App Store Optimization tools help to estimate the effectiveness of texts and graphics for games and apps for the users to find them faster, and therefore install them. 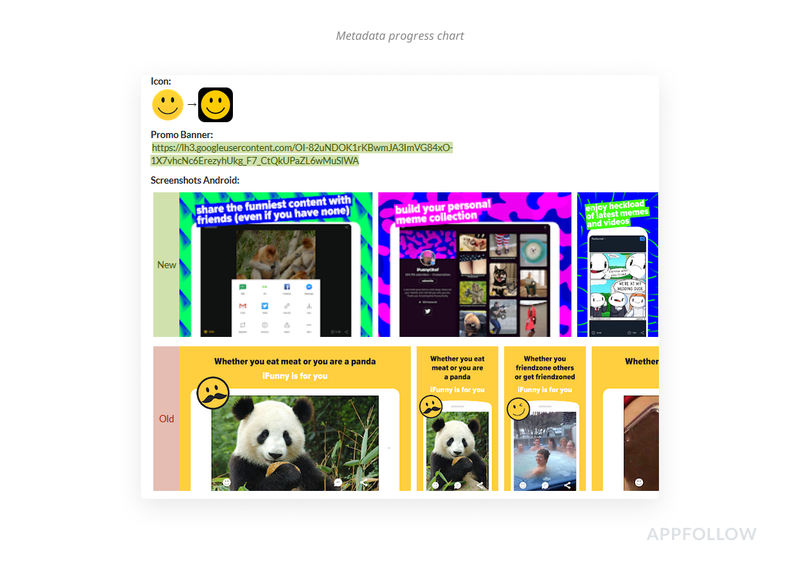 Our tools are easy to use, even new users would learn fast what customers look for in the app stores and how to get into the top apps or improve the ratings. 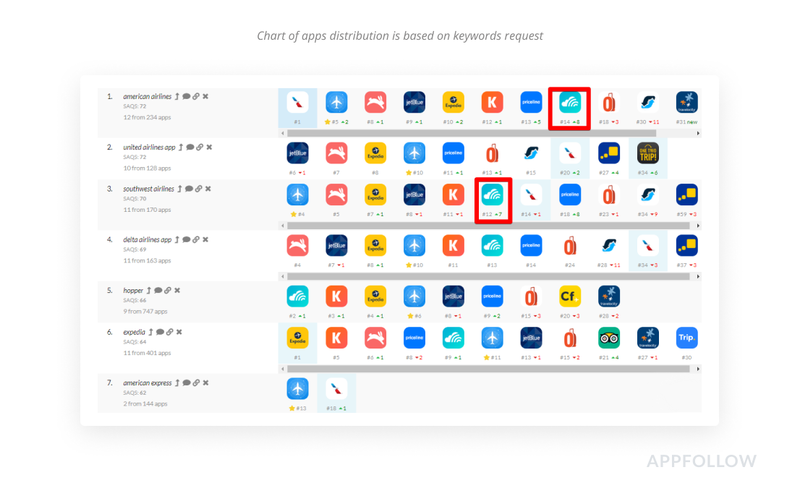 Increase an app’s discoverability: do app store keyword research to find popular requests or see what other app developers do. 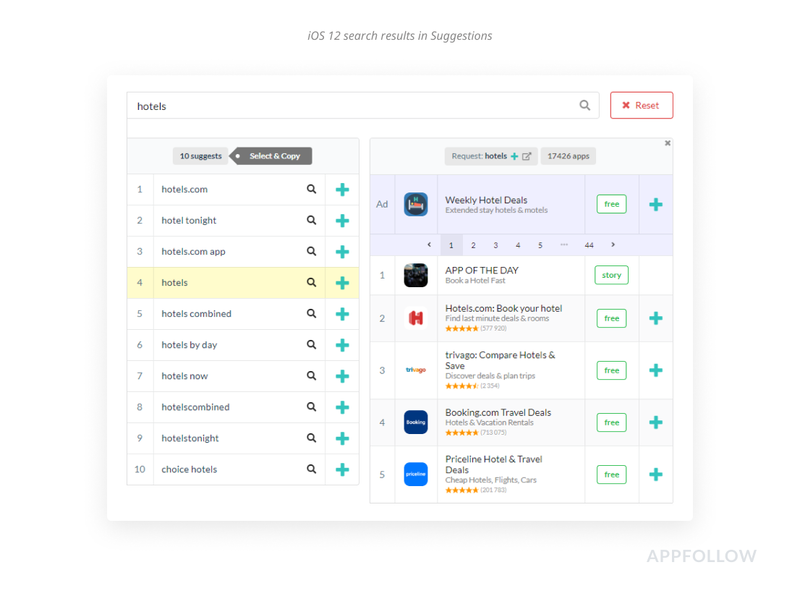 Use Suggestions and Keywords & ASO tools to show the exact search results for the App Store (based on iOS 12) and Google Play to choose popular requests. After that, check your ranking positions and weigh the chosen words in Keywords & ASO to work with the most popular ones. Left: search results on users’ requests of “hotel”. Right: apps that show up on that request and are being promoted by Search Ads. “Hotel” is a popular request word, so it’s pricey and difficult to get promoted by it. There are other options with less competition, e.g. “hotels now” and “hotels tonight”. 2. Maintain positions using only the necessary keywords. If your app is losing positions, react immediately. Keep track of everyday changes or analyze the metrics weekly or monthly. Get reports on Slack, Discord, or e-mail. Check the chart with the current positions and research what changes to the product have led to it. 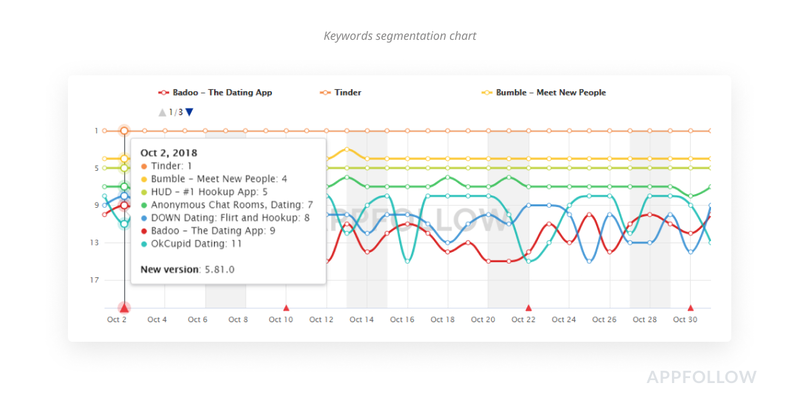 App positions based on keywords request changes every day. The chart shows how the positions are different depending on new updates (red triangle). 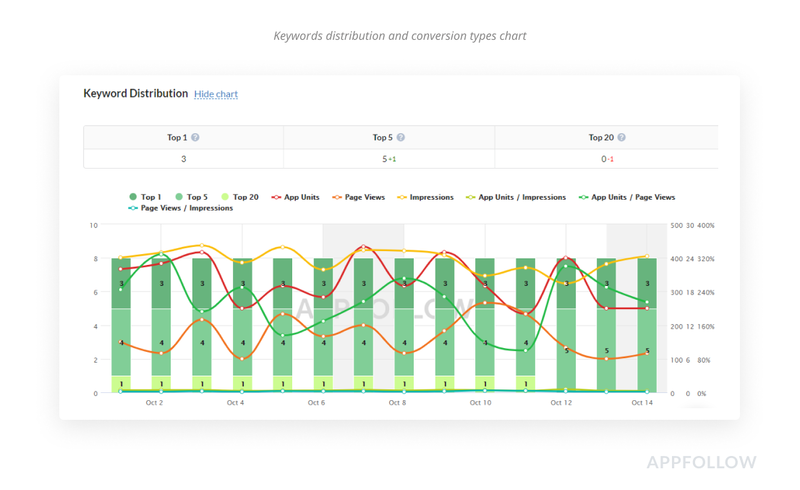 Keywords popularity is also seen on the same page, on the Popularity chart. Green means “a popular request”: the lighter the color, the less popular it is. 3. Increase install conversion rate by measuring the position progress and ASO strategy. 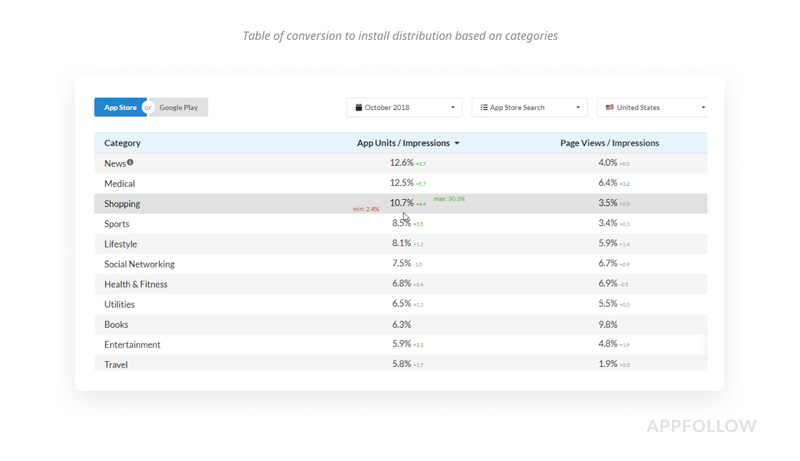 The analysis shows what keywords bring more installs, how users react to graphics (view to install conversion), and the effectiveness of the strategy in general. Then you will know when you need to change your ASO strategy or start an ASO audit. This chart shows the connection between page views and installs. 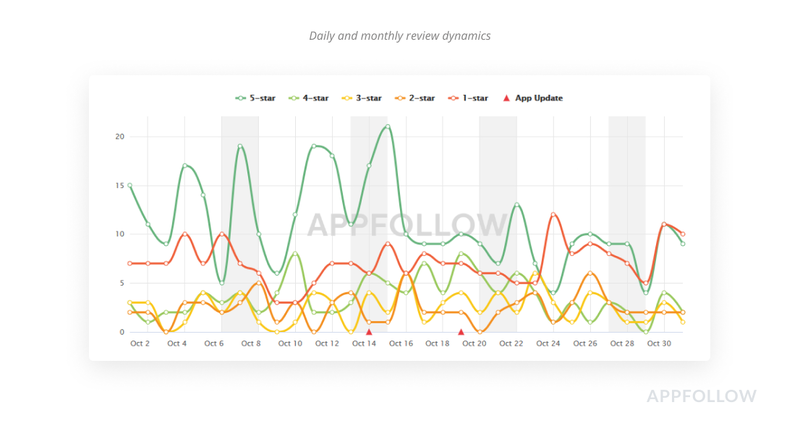 For example, on October 4 the number of views was stable but app units dropped. Now you can figure out what went wrong, e.g. the featured review was changed or a ranking was low. 4. Focus on the key traffic channel. Search results, featured lists, or paid traffic are all the options to see what works better in this or that category and not lose money. For that reason, you will definitely like AppFollow Benchmark which shows the average conversion of the categories and channels in different countries according to AppFollow data. A conversion benchmark helps to understand where a user comes to a category from. The data updates monthly. 5. 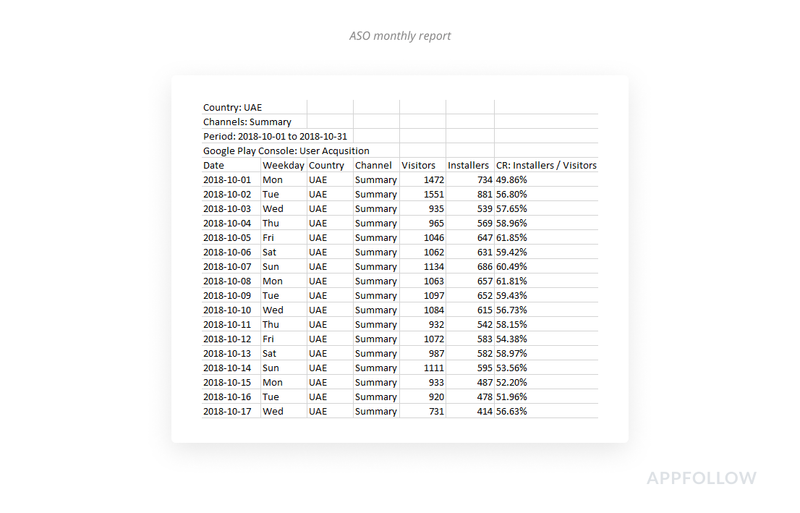 Improve the ASO strategy with an app competitor analysis. Monitor what they add or change in the texts, how they optimize graphics, and how it results in the positions ranking. Check the changes of competitors’ positions on Slack or the Keywords Summary tool. If there is anything catching your eye (like in the example below), look for updates and what requests have brought growth. Competitor’s position shows significant growth. If the growth is extreme (like in the example of Skyscanner), it might be that they optimized the texts and it’s time to start doing it as well. 6. Upgrade view conversion of the page by improving the text and graphics display. Make sure your title, screenshots, description, and video to look awesome on the app page along with the search results. With App Preview check out the results before actual publishing. Screenshots and text don’t look the same on different device screens. The SE has a smaller screen so that’s why it needs to have larger details, otherwise it won’t be visible on the search page. App Preview helps effortlessly test images for different smartphones before publishing. 7. Analyze how previously made steps impact the installs. Data can be downloaded right in Excel as a CSV format, or use the Google Sheets Add-on for your convenience. Data in tables are ready for analysis, and you won’t need to go to App Store Connect and Google Play Console to get everything for your report manually. It’s really easy to edit and analyze data from the reports. Get views, installs, and conversions in all countries daily. Get more app downloads, be ahead of the trends, and watch what other companies do — that’s what you need to keep the ASO strategy working. A reply to reviews system helps to communicate with the users everywhere support, marketing, and development departments are involved. 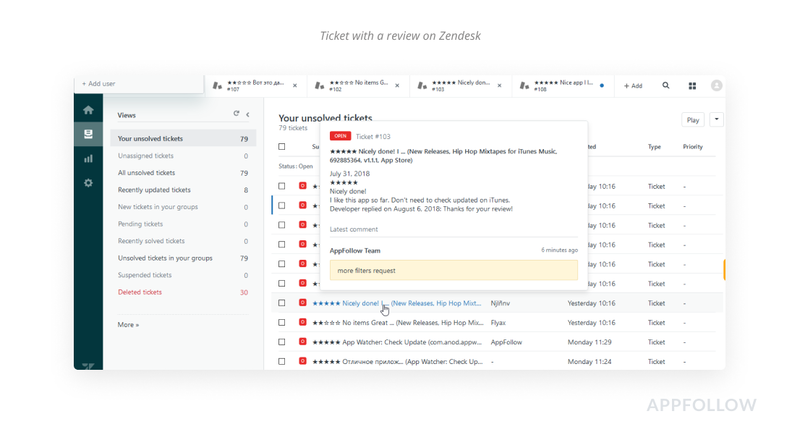 Choose what you already use for working with the customers: Help Desk services (Zendesk, Intercom, Helpshift, etc), email, Slack, or even Microsoft Teams. Customer reviews can be helpful for both support managers, developers, and product managers. They help find bugs and fix them or develop a killer feature that will raise the average rating. Learn about reviews instantly. Push notifications come on Discord, Slack, Trello, email, or any other Helpdesk service such as Zendesk, Helpshift, Freshdesk, etc. 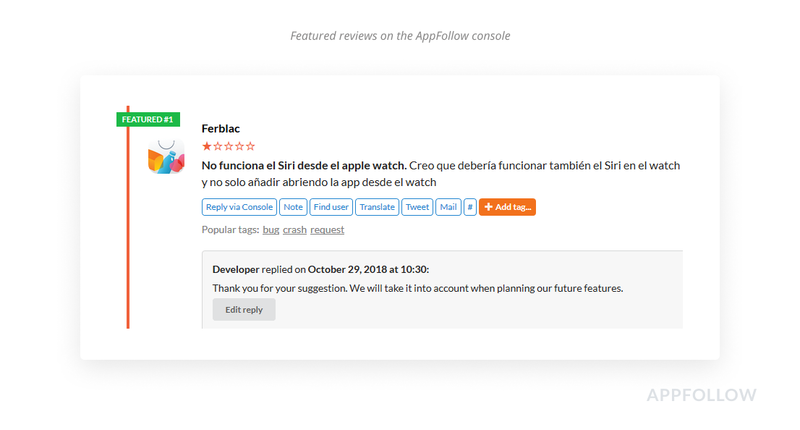 For example, iOS developers get reviews on the iOS version of the app or Spanish-speaking support agents work strictly with the reviews in Spanish — no distractions and effective task distribution. The notification will show a user’s location, device, and app version along with the language of the review including the automated translation. 2. React immediately. It’s easy to separate reviews with tags, e.g. “registration problems”, “subscription bugs”, “thank you reply”, etc. This way you can quickly find the necessary review to update or pass to the developing team to fix. You can also inform users that you’ve fixed the bugs they were complaining about. Using tags speeds up working with reviews. E.g. the tag “new version” is used for update complaints. As soon as all bugs are fixed, use the tags to find the appropriate reviews and inform users that everything works well. 3. Reply within seconds to increase app ratings and conversion rate. "Thank you" messages or complaints and a developer’s reply — show that you really care about your customers. Choose the most convenient way to do that: AppFollow, Slack, Zendesk, etc. Support agents can simply combine Help Desk service with AppFollow to get updated reviews and response history. They can also set up the length of reviews to see the most critical issues first. 4. Reply faster with response templates. 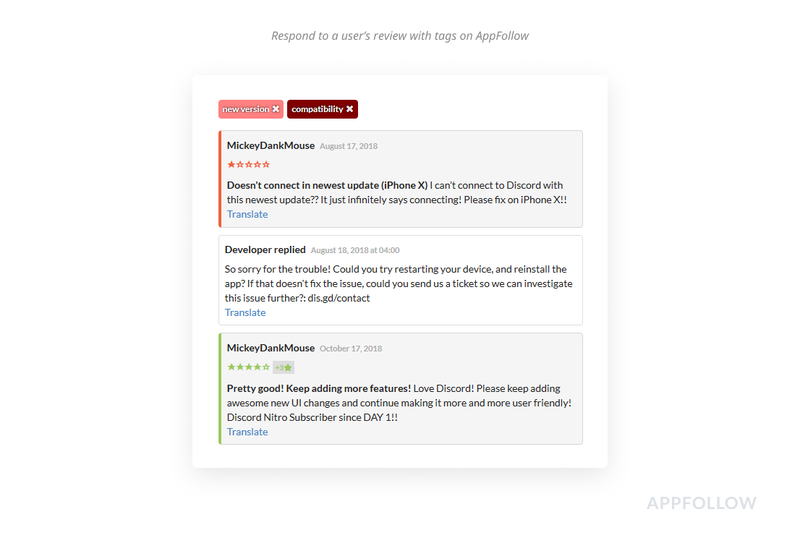 AppFollow allows to add templates on various topics: bugs, ideas, questions, and many others to be able to reply within only 3 clicks. It’s better to give a fast answer to users so that they change their minds and give you a better rating. 5. Increase user’s loyalty by perfecting the support team. 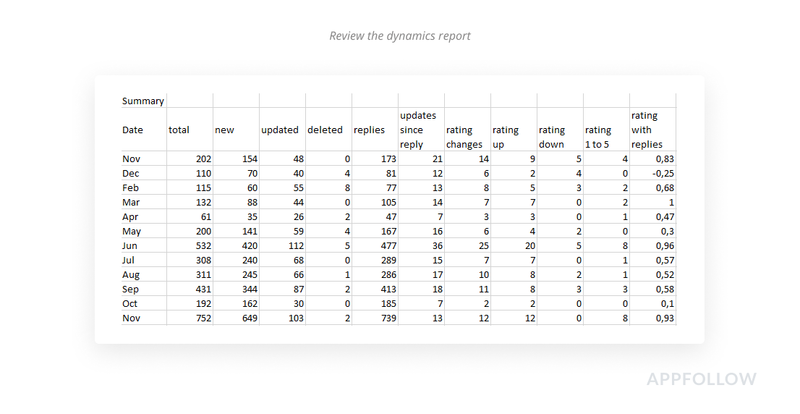 Estimate the agents’ work and how users change their ratings after replies. Use Reviews Analysis and Semantic Analysis to make a separate analysis of geography, languages, and app versions. You can also analyze other apps to find their weak points. Examine where users are more loyal, what app version they liked, and how you can change their opinion. This data will be visible for your competitors as well. 6. Working with featured reviews. Make sure that featured reviews showing up on the app page weren’t extremely negative and had developers’ responses. It’s important for conversion installs, especially for the paid promotion — a user gets an impression of the product having seen the first reviews. If a featured review is about the bugs or features, with any change update your response. This way your users will know that you listen to their suggestions and keep making the app better. It will have positive results on install rates. 7. Estimate the results of working with users. 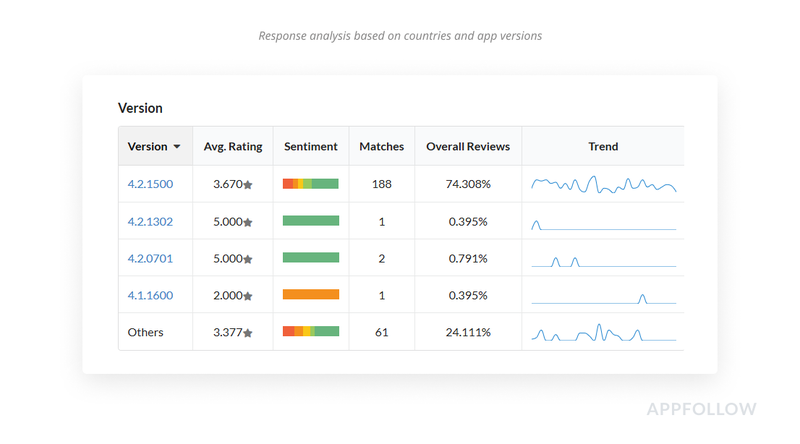 Analyze replies and review dynamics after support team’s answers. Do that right on the console or load the data. Constantly monitor the reasons of users’ ratings. On the day of the update, October 14 (red triangle), 5* went up but for only one day. It didn’t happen during the next release, on October 19. Analyze the topics to find out the reasons. Data can be analyzed daily or monthly. In the example above, users sent twice as many reviews and 80% of them were responded to. 10% of users updated their reviews which increased the rating by 1 point. Replies to reviews increase conversion and attract more users. This way you show them that their opinions matter. Loyal users use apps more often and stay on longer, keeping up the retention and high positions in search results. E.g. Google Play puts down apps in the search results with low retention and bug complaints. These and other AppFollow tools help make daily team tasks more automated and keep making your app better. If you want to give it a try, register here to use all our tips and tricks from the article.